A yummy pear salad recipe — and a new look for our blog! How do you like our new look? We’ve been doing a little spring cleaning — sprucing things up with a new name, a fresh coat of paint, and reorganizing to make it easier to get around and find things on our blog. Fun things. 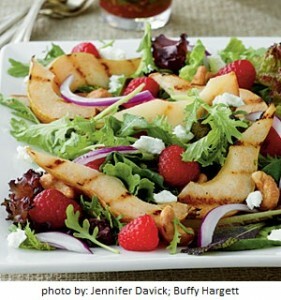 Like this delish Grilled Pear Salad recipe from Southern Living that I’m going to try this weekend. We’re fond of pears, for obvious reasons. 🙂 So if you have a great pear recipe, add it below and we’ll start a collection! We can all use more spring recipe ideas, right? 1. Preheat grill to 350° to 400° (medium-high) heat. Grill pear wedges, covered with grill lid, 1 to 2 minutes on each side or until golden. 2. Whisk together red wine vinegar and next 5 ingredients in a small bowl; add canola oil in a slow, steady stream, whisking constantly until smooth. 3. Combine salad greens, next 4 ingredients, and pears in a large bowl. Drizzle with desired amount of vinaigrette, and toss to combine. Serve immediately with remaining vinaigrette.